That was all we needed to hear, we got our current 2007 Caravan in 2010 on a similar deal as a “temporary” measure. After 7 years and 200,000 km we had been looking to replace our faithful but tired workhorse with a newer version. The deal was indeed goofy, one of these depressingly common transactions where the person rolled the balance from their last vehicle into this one, still owes more than it cost new, and wants to roll that balance into yet another new vehicle if they can get the financing. Apparently if Pa were to tell such folks that it’s not such a great idea he wouldn’t be able to pay his bills either, such is the nature of new car sales. At any rate, the deal did go down so on Saturday we were off to the dealership bright and early, and saw a few CCs on the way there. 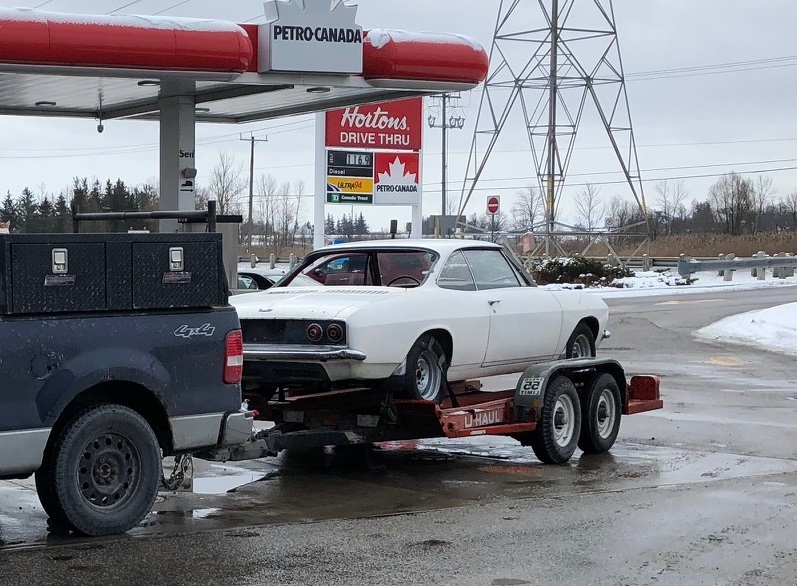 We stopped for coffee at Tims, and there in the parking lot was a late model (1965-1969) Corvair on a trailer. It was obviously a project, the back window out and parts inside. Looked like a good Christmas present for someone. After our CC trip to Detroit this year I have a bit more appreciation for Corvairs, the 2 door hardtop does have a fine sweep back to the slim C pillars. As we came out with our beverages the Corvair was leaving, so I gave the guy a thumbs up. We had found out a bit more about this particular Grand Caravan during the week. It was very low mileage, about 25,000 km but there were concerns. It was a CVP van, which means Canada Value Package and also means we would have to work around some compromises. For starts the 2016 CVP came with a fixed middle bench seat, the narrow kind. Our teenage kids expressed their displeasure at the idea of riding around squished together, so after a bit of research we determined that it was feasible (if an expensive PITA) to obtain stow and go captains chairs and do the conversion. Next we passed this D series International pickup, I’ll guess it’s about a 1965. I really like these trucks, the stoic and purposeful face, the way the large windshield comes right down to the base of the A pillar. Also the DougD family is an IH family as far as farm equipment is concerned because my mother worked at the Hamilton plant in the late 1950s. 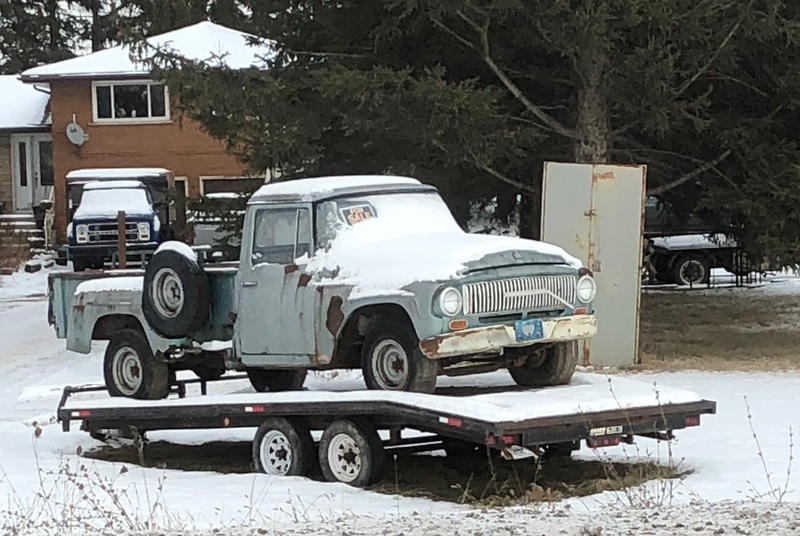 As much as I like them in general this specific example will not find a place under my tree, cornbinder pickups are notorious rusters and as you can see this one looks to be in an advanced stage of rot. Another CVP van issue was the lack of roofrack. The last two minivans I’ve owned have lacked this feature, and it has been a source of annoyance for me the last fifteen years. We do a lot of canoe camping, which necessitates a time consuming strap system to hold a canoe down on the rackless roof. We also like to carry our Christmas tree around on the roof, so all in we’d be looking at me being annoyed about ten times a year for the foreseeable future. Speaking of annoying, well maybe this is more like discouraging. 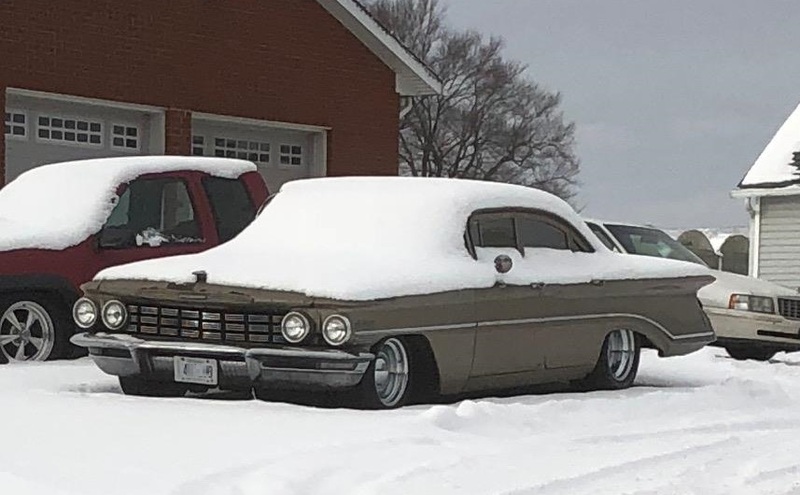 A nice 1960 Oldsmobile sitting out in the snow when there’s a perfectly good garage right behind it. As much as I like all 1960 GM cars, the generic looking Olds front end isn’t my favourite. The back end is much more distinctive on these, with the quarter panels angled out like that. Good chrome wheels with baby moon hubcaps too. Although plated with historic plates this Olds appeared here about six months ago and I don’t think it has moved in that time. This is a photo of the actual van in question. We got to the Ford dealership about an hour after it was turned in, and slogged to the very back of the dealer lot with Pa to check it out. The inspection was quick, Mrs DougD opened a door, stuck her head in, said “Nope” and slammed the door. I did the same, it was so smoky inside it felt like I’d inhaled a whole pack just taking one breath. Everything was well coated with ashes inside too, so for once we said no to Pa’s deal of the century. My father in law was a bit irked, the salesperson whose deal it was had told him he thought it hadn’t been smoked in. He half heartedly tried to sell us on a used Explorer as we walked back to the front, but he’s tried that before and knows that we really want another van. The smoke van is still for sale, it looks better cleaned up in the photo than when we saw it, hopefully it smells better now too. So it appears that our temporary, short, red, non roofrack, non ABS, non stow and go Caravan will keep going for now. Besides it’s got snow tires and as you can see we need them this week. Hope you enjoyed the trip, Merry Christmas/Happy Holidays/Joyous Whatever from the D family to yours! Not that I blame you for passing on the rolling ashtray but what kind of price does a one year old CVP Caravan fetch as compared to a new one up there? 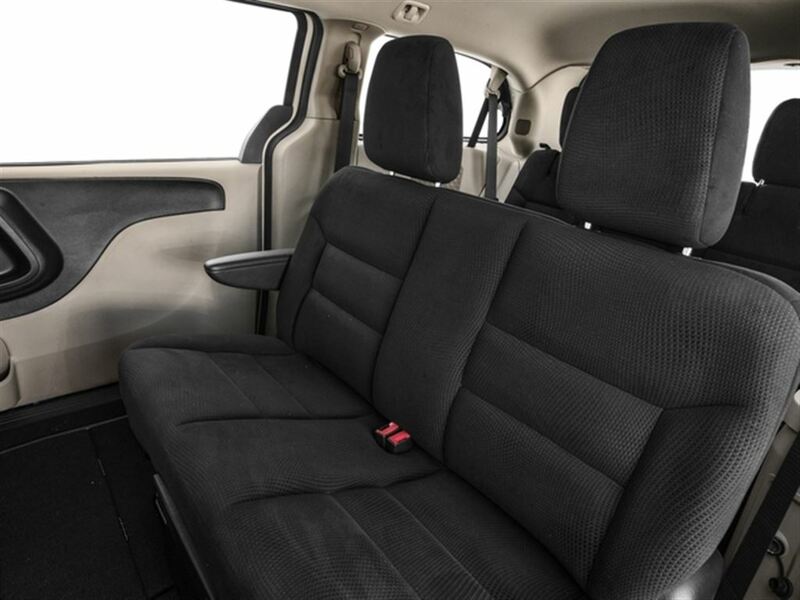 I do like that Chrysler has figured out that black seats and black carpet make much sense in a minivan and also makes it look attractive and non-dreary with the biscuit colored trim in other areas besides stain-prone ones. My Volvo V40 didn’t have roof rails either but we were able to add them ourselves after removing the existing rain channel covers, the attachment points were underneath, but I’m not sure how either generation of Chrysler vans does it. Thanks jim, but without a roof rack there is no way to carry the aluminum pole! The pole can mount to the trailer hitch! A 2017 CVP lists for about $32k, the local dealer is advertising $24k. The smoke van is now listed for about $17.5k and we were hoping to get about 2k or 3k off on the family deal. We are thinking an SXT trim would be more to our liking. Hey Doug, let us know how the Feats of Strength turn out. I’d have said no, too. Hopefully, that Corvair will get out back together and roll down the road again! 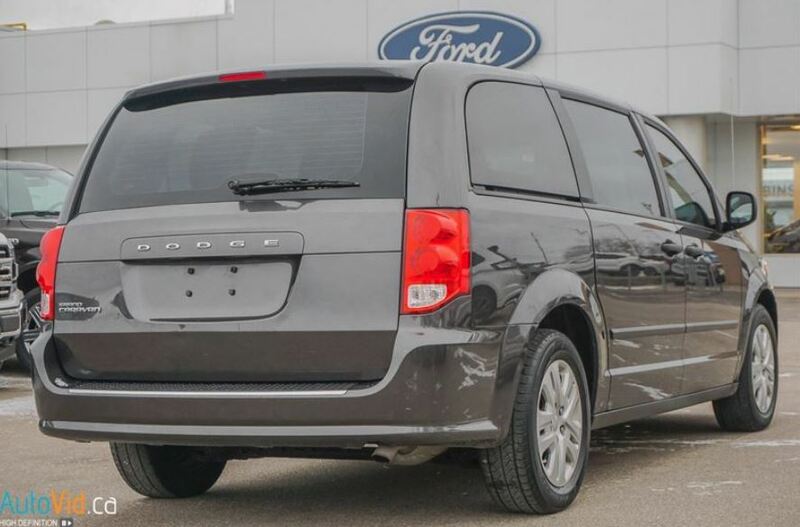 It doesn’t even have the main attraction of the AVP/CVP Caravans – they’re one of the few modern minivans available with windows NOT tinted black! Smoky interior can be successfully cleaned using ozone generator for AC cleaning + new filters. But understand it was a deal killer. 4th generation of Chrysler minivans are great vehicles, especially with 3.6 pentastar engine. I had rented them several times when on vacation in USA, but dislike the transmission looking always for the correct gear. But it was perhaps due the eco mode ON. But for my van I ended up with 09 Toyota Sienna. Its 8pass version as i required 3 individual seats in second row for my kids (1+twins). Captain seats are great, but not offering 3 seats variant like Toyota does, seems in my view a marketing mistake. In my case the oldest one is still too small to benefit from 3rd row freedom and I prefers to have them all together in 2nd row. Anyway, I can recommend Sienna. I find it even better van then the Chrysler products and can be with 4wd drive. Also the stripper model does not have sliding door windows so I do not blame you for passing. Wise to just say no. Once a smoker’s car, always a smoker’s car. Doesn’t matter what brand of cleaner, air “freshener”, ozone generator, or other allegedly magic deskankification technique is applied; the stench cannot be removed. It can be temporarily suppressed or masked, but it always, always, always comes back. Smoking is an expensive habit in Canada. Maybe if the owners of this didn’t, they might have enough extra money not be upside down all the time. A pack of Marlboros is $10 CDN, Roger. A pack a day is normal, at least for the smokers I’ve known. Well that comes to $3650 a year, if both spouses smoke, that’s $7300! Nearly $22,000 for a pack a day couple over 3 years! That’s almost the price of the Grand Caravan right there. So very cheap 20 cigs here is $23.00. $1.20 US here in Sunny South Africa for off brand smokes and half that in Zimbabwe or Malawi etc. Expensive? Pfft! Here, a packet of Marlboro is $30AUD. I am extremely glad to be reformed. In my foolish earlier times, I didn’t do it in the car, as even I couldn’t deal with the pong. No way I’d buy such a car either. I refuse to stay in hotel rooms that smell like smoke, date women who smoke or patronize businesses that allow smoking, and I won’t even consider a vehicle that’s been smoked in, no matter how good the price. Part it out and scrap anything smoke touched. Used car shopping can be quite frustrating I know what I want but manual examples are quite thin on the ground, I’m sure some were built its just that nobody will sell one. There is also a nice looking ’67-’72 Chevy C/40-60 medium duty behind the International. You might want to consider a used Mercedes Metris. More space, better economy, and RWD makes it much more capable in the snow. Interesting suggestion, and I wish I knew in which part of the world you live. 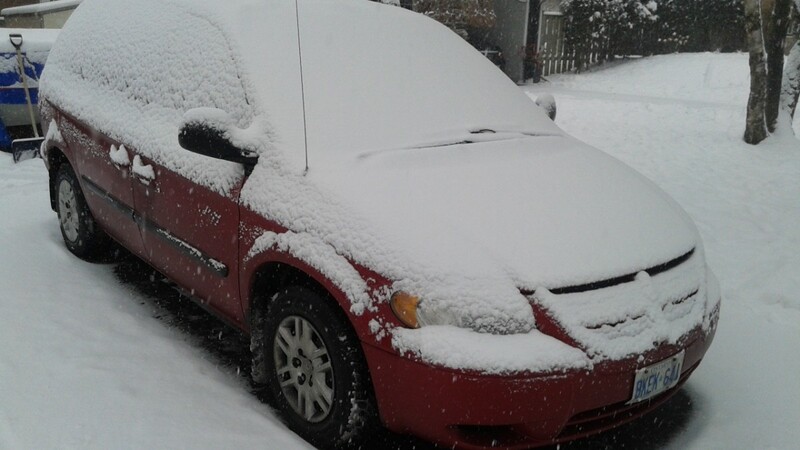 In North America, FWD is generally seen as more capable than RWD in the snow; the company-issued Grand Caravan I chose seems to do very well in such conditions. Doug appears to be looking for a good deal. In the US, a Mercedes product carries a higher purchase price as a “premium” brand, and historically the long-term maintenance costs are not for the faint of heart. Yet another reason why I love CC: You get to see automotive perspectives from all over the world. The Metris is very capable with a strong turbo four. It is a much superior vehicle to the Chrysler Caravan. A one or two year old Metris from a rental fleet can be bought in Florida from Hertz or independent dealers after Hertz wholesaled it for between $20 and $24K US dollars. No argument that the Metris may be a fine vehicle, but I think I’d still prefer a Grand Caravan of similar vintage and mileage. Lower purchase price and maintenance costs, better winter traction, and Stow-N-Go seating for the win! The Metris minivan is called the V-Class here. They’re quite rare. But the panel van, called the Vito, is another story; it’s all over the place. 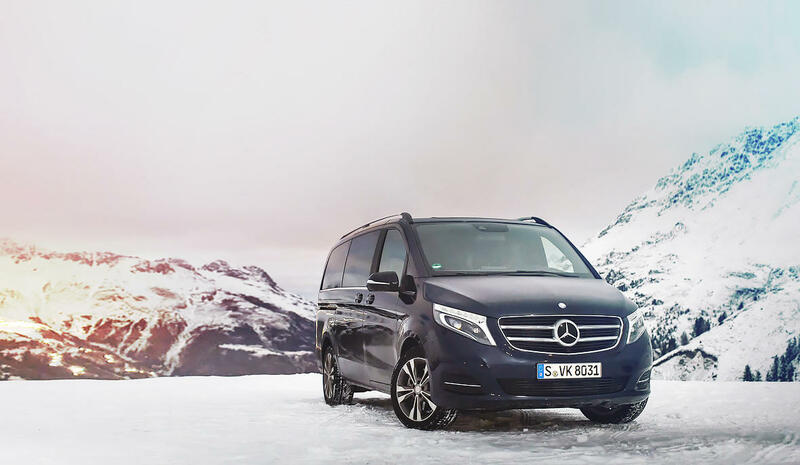 Both the V-Class and the Vito are only offered with a 4-cylinder diesel. I checked the German Wikipedia site, there’s an AWD V-Class too: the V250 BlueTec 4Matic. Picture below. I don’t think you will like the current generation of Caravan as well as yours. 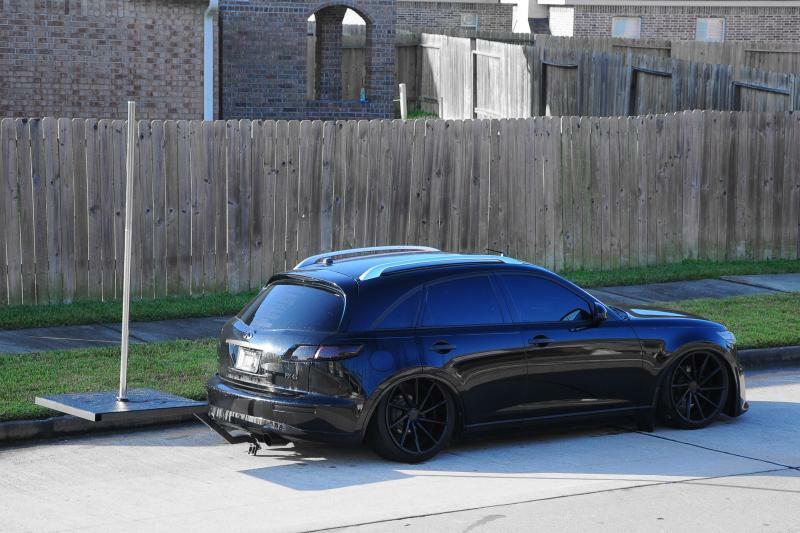 The structure is not as stiff and the transmission shift characteristics are annoying. At least that was my impression living with a rental a few years ago. Yeah, that’s kind of why we got a 2007, that was the last year of the previous generation before the “squaravan”. We’d consider a Sedona or Sierra if one came along on the Pa deal program. Mercedes Metris is so rare & expensive it’s laughable. Didn’t even know there was such a thing and I drive by a Mercedes temple every day on my way to work. Being a good Canadian boy I’ve got some attachment to the Caravan, since they are built in Windsor Ontario. At any rate it’s just a tool, I’m not planning to impress anyone and my vehicular interests lie elsewhere. I recently looked at a used Mini. I opened the door and commented that it had been smoked in. The salesman said no. He stated that ants had gotten into several cars and the odor was from a bug bomb. Quick thinking with his BS reply. My comeback was that the insecticide must have been nicotine based. No sale ! Every time I hear a horror story of someone rolling debt into debt for a new car I just shake my head. I’ve come to the conclusion that people actually step up to commit to their own destruction. It’s like well off people putting all their money into one man’s hedge fund because year after year it’s gotten returns well above the market. Not just some money, but all of it and more [2nd mortgages and such]. Then, surprise surprise: it’s a Ponzi scheme. I always wonder if I missed the day at school that explained math and there was some key that would make algebra make sense. And I tried. But even EYE know the folly of chasing too much stuff without enough money. DougD: does your Father In Law have any insight into this ? And good for you for keeping the old steed. Maintain it. Have it inspected thoroughly. Replace worn stuff before it breaks [years on the road vs mileage]. New belts, hoses, plugs, fluids,Waxoyl, a detail. Then have a set amount put into savings every month, before you pay the bills. You won’t miss it. You’ll thank that smoker in a couple of years. Well, you never know. Obviously I don’t know anything about other people’s financial situation, they may well be able to easily afford it but want to do it this way. Pa says people just want new cars. Some people go shopping at the mall for fun, some people want a brand new car every year. Interest rates have been low for a long time, so with houses and cars it’s all about the payment not the outstanding balance. I shake my head too but it seems to work for an awful lot of people, so I don’t know that it’s as bad as insane destruction. We’ll keep driving and maintaining the van as long as it lasts. It’s got 270,000km on the clock, it is getting tired. The transmission is a little slow on the draw on cold mornings, and it burns a litre of oil every 3,000km. We wouldn’t lend it out for a church youth group trip to South Carolina, or haul our tent trailer all the way to Banff with it anymore. The money is in the bank for a newer one, but we’d prefer to buy something from my father in law. He makes some money, we save some money, he enjoys helping us, everyone feels good. and s-l-o-w-l-y shift thru the 3-on-the-tree. ….. and all’s right with the world …. Good for you and your wife for objecting to the smell of the interior and not caving into the sales pressure from family and foe the salesman. Too bad the van was sullied. It looks nice. Also I remember riding in my grandfather’s IH truck of that vintage, but in forest green. He always had a ball hitch literally strapped on the front bumper for his fishing boat. I guess he never learned to back a trailer. I also always wondered why he was fiddling with the column shifter and stomping on that other pedal (my family only drove automatics). It wasn’t until later I realized it was a “3 on the tree.” Great memories! I wasn’t aware any minivans were available with a middle 2-passenger bench anymore. Maybe it’s just Canada being Canada?